What’s not to love about a mac & cheese pizza! 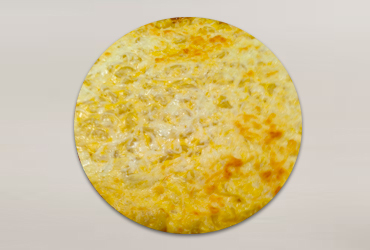 The Chanticlear frozen fresh mac & cheese pizza has quickly become a crowd favorite. While a pizza purist might opt for a more traditional flavor such as our veggie delight, sausage, or pepperoni, our mac & cheese is catching the taste buds of pizza connoisseurs everywhere. And they are coming back for more! All of the Chanticlear Frozen Pizzas are locally made and start with a family secret, thin flaking crispy crust. And when it comes to cheese, we don’t cut corners. Our 100% Wisconsin mozzarella cheese is grated right off the block daily. The flavor is an absolute game changer as the cheese simply melts in your mouth. And when it comes to the mac & cheese pizza, the difference is clearly in the cheese. At a recent pizza demo we sampled the mac & cheese and the response ranged from excited parents wanting to share it with children who love products like Kraft Macaroni & Cheese, to others who were going to serve it as an hors devours at a gathering. The rich flavor of the mac & cheese on top of the thin flaking crust is an absolute winner! If you haven’t already done so, we invite you try our mac & cheese, along with all of our various flavors of pizza, which includes the extra cheese for all of the cheese lovers out there! The holiday season gets hectic and busy so stock up on great pizza that will provide the perfect snack or meal for the family! Chanticlear Frozen Pizzas are available at most of your favorite stores, but please let us know if you have a craving that can’t be satisfied and we’ll try to work with your local store to start stocking our delicious line of pizzas, including of course, the mac & cheese!